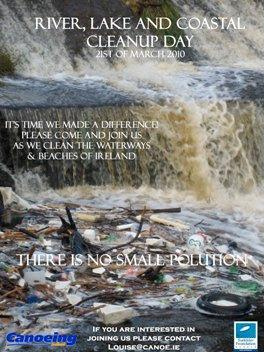 March 21st is the Europe wide River, Lake & Coastal Cleanup Day which is part of the worldwide Oceans Initiative 2010. Rockhoppers and the ICU are going to tackle the Liffey from Wren’s Nest down to the center. After the last floods the riverbanks and trees are covered with rubbish and we hope to get rid of that on that day. We will meet up at the ICU in Strawberry Beds at 10 am and hopefully be finished by 3 pm. And afterwards we can all go to the Strawhall for some refreshments! We need as much people as possible, own boats would be great but a few can be provided by the ICU. Just make sure to bring some gloves and, if you have, some garden tools as rakes or clippers. It will be a great day out and we can tidy up our favourite playground a bit! This the Lir Rockhoppers challenge for 2010!! This is a big one. Myself and Marcus have already spent 100 hours organising this so I want everyone to partake! All teams should comprise of four members, have a team name and a team captain! Snack food and drinks will be available at the final destination.